This brownbag talk discusses research on the domain of motion to investigate the differences in how native speakers of English and Russian talk about motion and space and how they interrogate motion events not only verbally but also visually. This lecture examines Michał Witkowski’s 2005 critically acclaimed Lubiewo (Lovetown). 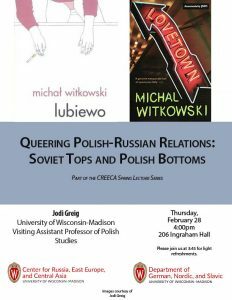 Witkowski’s novel builds an ethnography of a lost era, permeated with nostalgia for socialist Poland and for the seemingly plentiful queer sexual encounters in parks and Soviet barracks.